Compact unit requiring little space. Designed and engineered for chamfering and trimming inner and outer end angles on circular pipe or bar stock at one time, providing efficient and precise performance. Simple structure made possible by shaft server motor drive and cam-feeding with the same motion and shorten cycle time. Easy setting and fast adjustment by touch sensing screen. Easy operation allows one person to control multiple machines. Motion cycle includes automatic material in feed through a channel(automatic feeder is optional). Automatic cutting feeding retracting and automatic workpiece out feed. 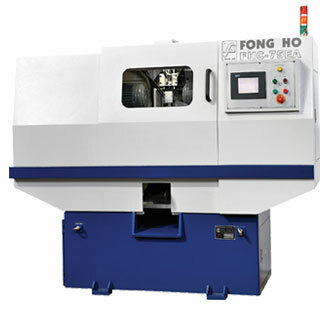 Continuous motion cycles provide high machining speed, high accuracy, reduced labor requirement and easy operation while greatly upgrading productivity.